There is often much confusion around booking classes and fare basis codes. However, once you understand its purpose and how to determine it you’ll realise it is fairly simple. To make your life easier FlightSiteAgent has put together a fact sheet of all you need to know about understanding fare basis codes and booking classes. How to identify fare basis codes and booking class codes? A fare basis code is an alpha or alpha-numeric code used by airlines to differentiate between the various class types and allows airline staff and travel agents to find the rules applicable to each class. The first letter in that code is the booking class code. SA: Indicates the country, usually used when it is an international fare. The B is airline specific and could indicate anything from whether it is a return fare to what baggage allowance is allocated to the seat. What is the importance of a fare basis code? Routing restrictions or change penalties. Please note that each airline has its own style for writing codes and the most important thing to understand is the booking class and its set rules. What is the importance of a booking class code? In the past IATA has tried to standardise the use of booking class codes, but over the years airlines have deviated and booking classes are now considered airline specific. Each booking class has a unique set of fare rules which are determined by the airline and can be very important to your client. 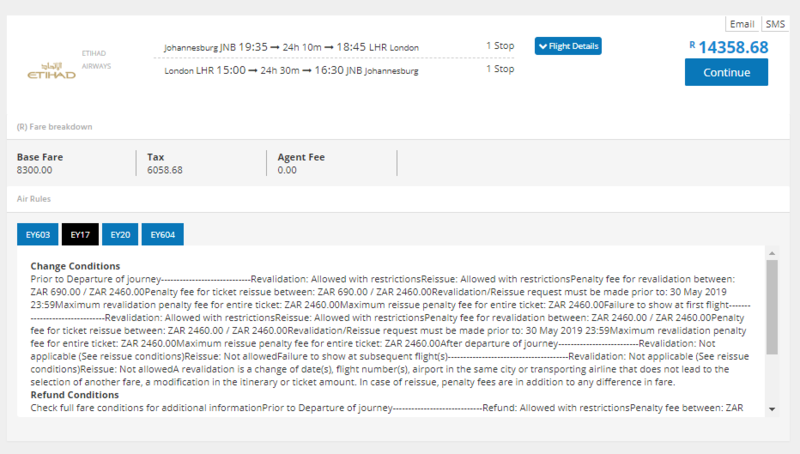 The FlightSiteAgent search engine will no longer display the booking code of each flight, but you can access the relevant Air rules which is the essential element. The rules associated with each booking class can be viewed by clicking on the Air Rules drop down. Here you’ll find the Change conditions and Refund conditions of each booking. If you require any other fare rules you can contact the team for assistance. Often people travel happily without being aware of their booking class, but as a travel agent it is important to know how this works and to provide your client with the relevant information regarding fare rules. Important fare rules like cancellation policies and penalties should always be brought to your client’s attention. Other fare rules like whether the ticket is upgradeable, changeable or will earn them extra air miles could also be important and worth mentioning – especially if the client provides you with a loyalty programme membership number. Now that you have all the information you need about flight classes we hope you find booking flights for your clients a quick and hassle-free experience. If you have any further questions, contact info@flightsiteagent.co.za or call 086 133 3392 and one of our friendly account managers will be able to assist.